Replacement Ink Pads for all brands of Self-Inkers. The Shiny self-inking printer rubber stamp, also know as the Shiny Printer with it's sleek look and smooth stamping action. 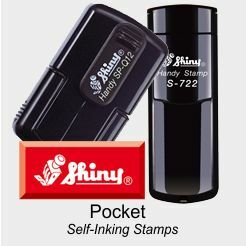 This Shiny self-inking stamp has a fit for every purpose: in the office, at home or on the go. Choose Round, Square or Rectangle. Order your Shiny Printer stamp below. When customizing your stamp, please choose the font size carefully.